The ultimate comfort food of South Indians. It’s a soup with a tamarind and tomato base, light. Perfect on a cold day, when you have a cold, when you’re too tired to make anything else, when you’ve been traveling and eating rich food and just want something comforting and light. Don’t be alarmed by the number of ingredients – if you exclude the prep time to soak the tamarind and cook the toor dhal, rasam is one of the quickest dishes you can make and can be finished in 15 minutes tops. If you cook rice while the rasam is boiling, you’ll have the ultimate comfort food in under 30 minutes. Pressure cook 1/4 cup of toor dhal/pigeon peas with a pinch of turmeric, in 2 cups of water. I typically use 3 measures of water to 1 measure of lentil/dhal. If using a timed pressure cooker, cook for 18 minutes after full pressure is achieved. If using an Indian style pressure cooker, cook for 5 whistles. The dhal can be skipped, but the rasam is more nutritious with the dhal. Soak a small lime-sized ball of tamarind in warm water. This can be done while the dhal is cooking. After about 30 minutes, extract the juice and strain. Add enough water to make 2 cups of tamarind water. 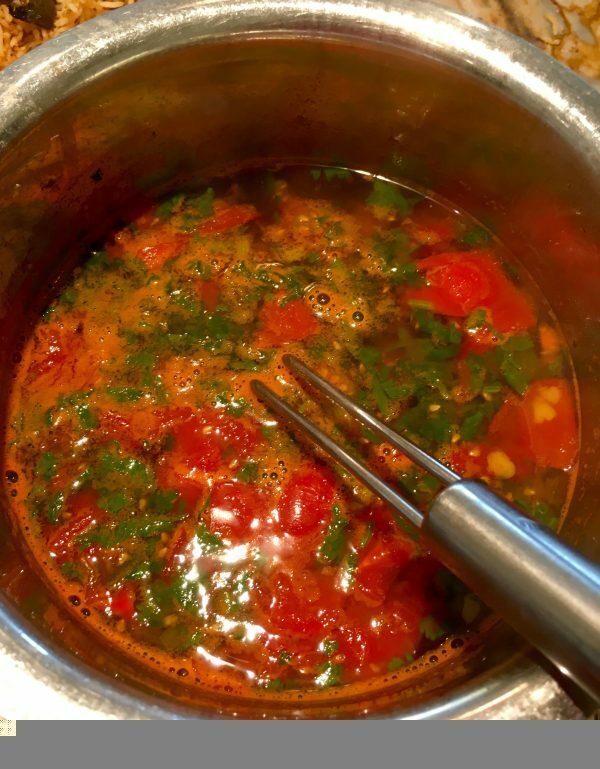 Chop tomatoes and cilantro finely. Let boil for about 5 minutes, until the rasam starts to froth. Take off the heat. I do this to save time: cook about 1-2 full cups (8 oz of dry) toor dal in about 5 cups of water (toor dal:water 1:3) in a pressure cooker once a week, and use it through the week for making sambar, rasam, kootu, or to just eat plain with rice and ghee. Rasam takes very little toor dal. Traditionally, the dal water that's floating on top of the cooked dal is added to boiling rasam to give it some protein boost. I use a litlte bit more, and take about 1/4 cup of cooked dal, dilute it, and add to the rasam. You can also make it with no dal, if you're in a pinch, but I would recommend adding dal to tone down the tamarind and to add some protein. Tamarind is a fruit that is used extensively in South Indian cooking and is considered one of the basic ingredients in a South Indian pantry. It is extremely sour in taste. To use, you would typically soak the required quantity in warm or hot water for about 15 minutes to soften it then use your hands to extract the juice. You would see "lime sized" or gooseberry sized to indicate the quantity. (I sometimes ask my husband to soak it if I'm out so it'll be ready for me. He is culinary-challenged, and I use tennis ball and ping pong ball size to indicate what size/quantity I need). I have a small colander with a long handle to then strain the juice into the cooking dish directly. In Indian and Mexican grocery stores.